The Venezuelan church endures despite national difficulties. 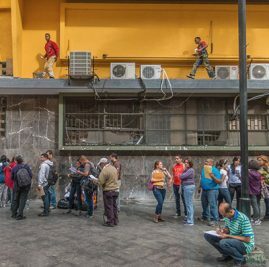 With Venezuela caught in an escalating political and economic crisis, the national middle-class people are the hardest hit by inflation rates, shortages of food and basic necessities, high unemployment, and government instability. And yet, small churches are still being planted and persevering under extreme hardship. David’s church has seen roughly the same number of people becoming disciples every year, but the church has struggled to grow because of emigration. Middle-class professionals often cannot find work and also want to escape the high rate of violent crime, so those who can leave choose to flee the country for jobs elsewhere. One young man moved to Shanghai, China for his MBA and stayed when he was hired by the Italian automaker FIAT. Church members have so far relocated to Panama, Colombia, China, Spain, Canada, and the United States. In response to the U.S. renewing sanctions against some of Venezuela’s top officials, President Nicolas Maduro announced this March that he would recall the top Venezuelan diplomat from Washington, D.C. On March 12, supporters and opponents of the socialist-led government marched in opposing rallies. Supporters criticized the U.S. sanctions while anti-government protesters demanded Maduro’s resignation. Venezuela and the U.S. have had tense relations since Hugo Chavez gained power in 1999. The International Christian School in Caracas used to primarily enroll children of missionaries. According to Marcus Shuflin, the school’s director, the number of workers from the U.S. entering Venezuela has steadily declined, from both faith-based and secular organizations. If being the country with the second highest murder rate wasn’t enough, Venezuela’s new restrictions on tourist visas instituted last year have further discouraged American visitors. However, Shuflin believes that what Venezuelan people need more than anything at this time is to know Christ. “It is critical that organizations like WorldVenture continue supporting and sending workers to the field,” Shuflin said. David plans to stay in Venezuela for as long as possible to be an encouragement to the local believers. To learn more about WorldVenture’s involvement in Venezuela, check out the Berkeys’ efforts to plant churches and evangelize in Caracas, as well as Rocky and Sylvia Engel in Maturin, Venezuela. Please consider giving to these couples to increase the efforts of church planting in these areas. WorldVenture is all too familiar with church planting in difficult places, including Italy, where one missionary says church planting is the answer to many of the problems facing Naples. In addition, one missionary returned to his home country of Ecuador to help his people discover the gospel amid antagonistic Catholic control. Pray that Venezuelan believers would be faithful and endure through increasing hardships. Pray the missionaries remaining in Venezuela would also be strengthened, as they are becoming more rare in the country. Pray for provision and peace for everyone living and working in Venezuela. Pray the church in Caracas would have its own building to expand ministry activities, house a pastoral family, and benefit from financial stability. Pray for a resolution to the national economic crisis and political conflicts. Pray that God would send more workers to Venezuela to help bring gospel influence to the country.